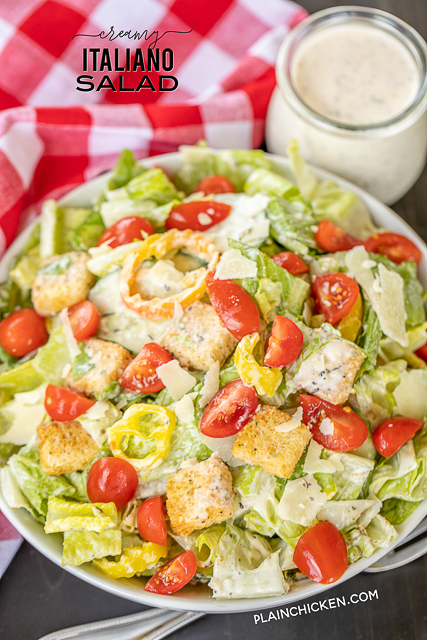 We are obsessed with this yummy Creamy Italiano Salad. It is seriously delicious. The tangy homemade dressing really puts this salad over the top! I made this for a dinner party and everyone LOVED it! It is super easy to make. I made the dressing earlier in the day, chopped the lettuce and tomatoes ahead of time and tossed everything together before we ate. SO easy and a real crowd pleaser! 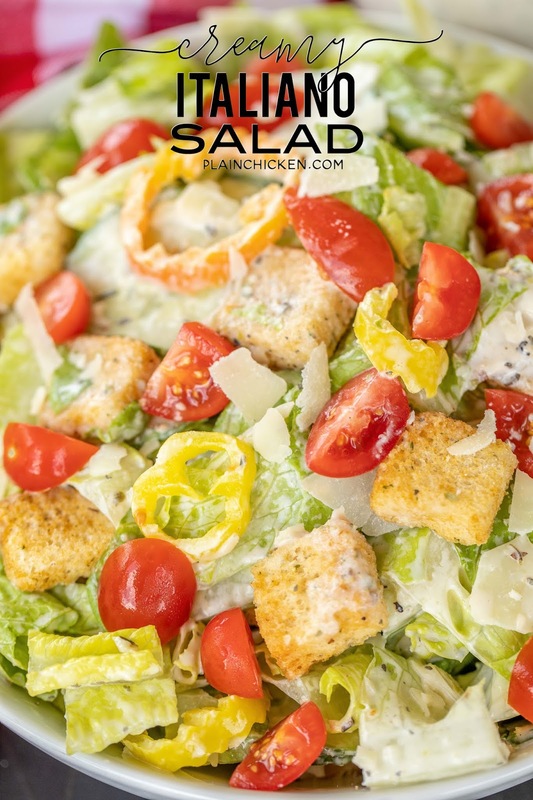 The salad is made up of romaine, tomatoes, thinly sliced seedless cucumbers, sliced banana peppers, croutons and homemade Creamy Italiano dressing. I know some people don't like cucumbers, so they are totally optional. For the croutons, I like to use the Olive Garden croutons that are in the grocery store. 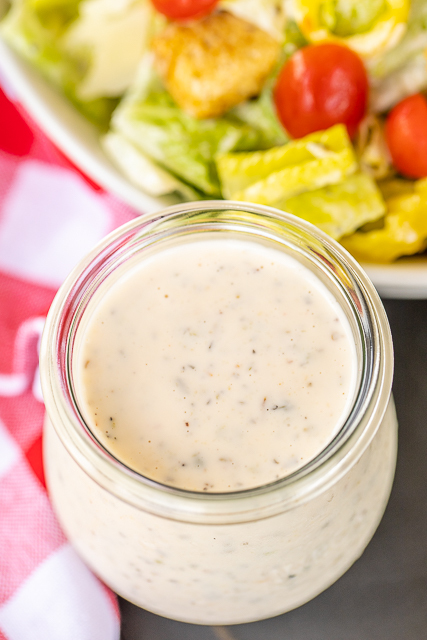 You can whip up the creamy Italian dressing ahead of time and refrigerate it until you are ready to toss the salad. I usually make the dressing a day or two in advance. If aren't making this for a crowd, just make as much salad as you want and toss it with a little dressing. YUM! As I said, the dressing really puts this salad over the top. It is a little tangy with tons of great flavor. The tanginess comes from the red wine vinegar. This just might be my favorite dressing. This Creamy Italiano Salad is the perfect accompaniment to our traditional Christmas Eve lasagna. This salad, my homemade lasagna and some garlic bread is my all-time favorite meal! Give it a try the next time you have salad. I promise it will be a hit! Whisk together mayonnaise, milk, vinegar, sugar, Italian seasoning, and garlic. Season with salt and pepper. 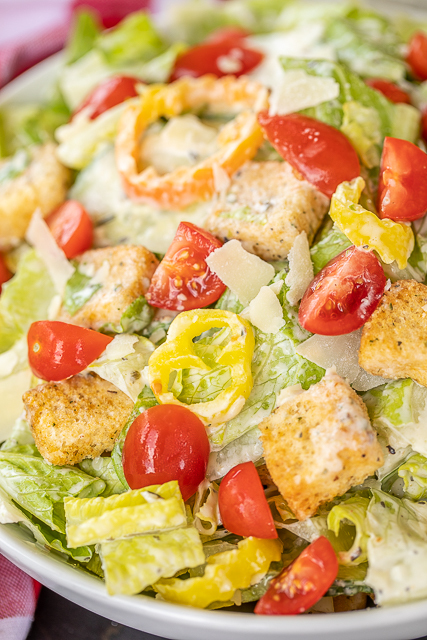 In a large bowl, combine romaine lettuce, cucumbers, croutons, banana peppers, tomatoes and parmesan. Add some dressing and toss. 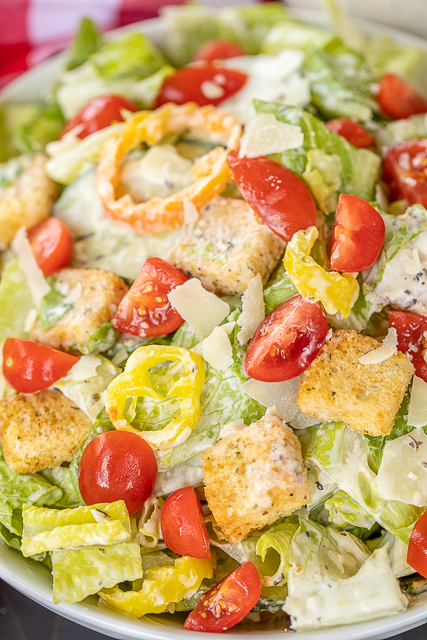 Continue to add dressing until the salad is dressed to your preference. You may have some leftover dressing.